Be part of our first State Membership Convention and help us launch Arkansas' New Americans Dreams Platform- the backbone for another year of advocacy and the expansion of the Immigrant Resource Centers network! The Gala will encapsulate our last 6-years of immigrant organizing as well as recognize our partner Change Champions who have been leading the way in building welcoming communities and the immigrant Change Agents whose leadership is catapulting forward the Arkansas movement. 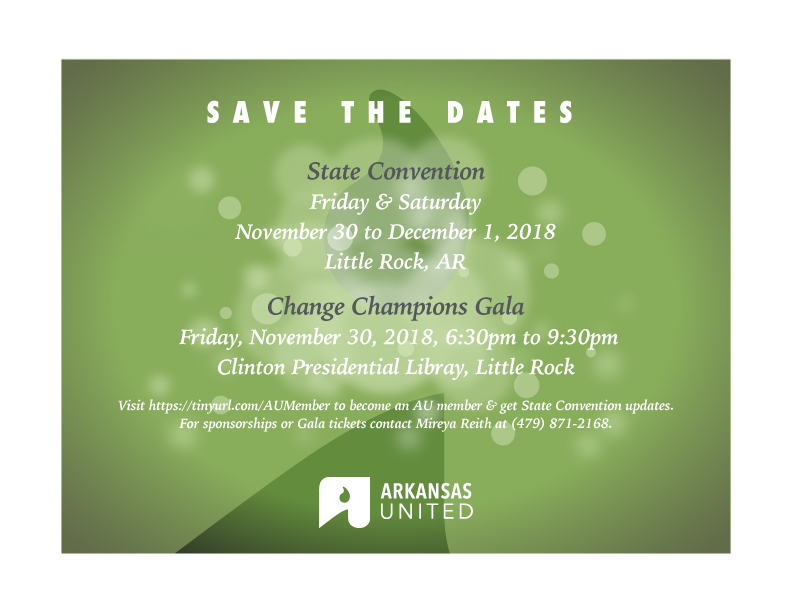 The AU State Convention will be occurring November 30, to December 1, and the Change Champions Gala will be held at the Clinton Presidential Library on Friday, November 30, 6:30pm to 9:30pm with keynote Congressman Luis Gutierrez. Both events will be held in Little Rock. More Details to Follow. Stay Tuned.